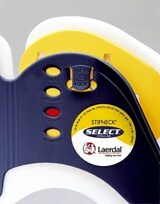 Laerdal Stifneck Extrication Collar | BMK Ventures Inc. The Stifneck Select has an oversized tracheal opening for advanced airway procedures and pulse checks, as well as a rear panel opening for c-spine palpitations, ventilation, drainage and visualization of the neck. The Stifneck Select performs well regardless of weather conditions, due to its in-molded Velcro fastenings. Because the collar packs flat it is also spatially efficient.